First, let’s wrap up November’s business. 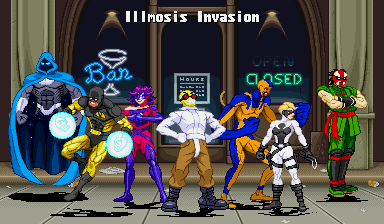 I planned to make a bunch of sprites based on my own characters to celebrate the main Illmosis site’s anniversary month, but a lot of things got in the way. The biggest is that I wanted to redesign many of the characters I was going to sprite. Two of those characters made it through, though: Exponent and Hostyle. Along with a new sprite of Nutroll, they kick off the long overdue Illmosis character section in the Illmosis gallery. You’ll also see a lot of sprites that were only on the Illmosis site until now. The out-of-scale Endless Duck sprite from 2011 was finally added to the ScrollBoss section, too. 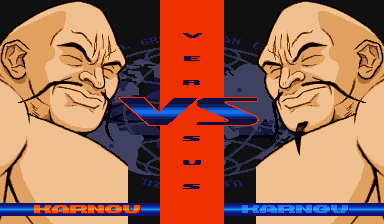 I’ve also made a new SFA3 portrait for Karnov to replace the old E.Honda-edited version to rep Karnovember a bit more. Finally, the prints in the shop are on sale until this Sunday, November 6th. 8×10 and 8×11 prints are $4.50 each while the 11 x 17 prints $8.50 each. Anyone looking for a wider variety of prints should check the Illmosis site print page, because it goes beyond the video game theme of this site. Cyber Week will continue with… actual cyborgs? Word! BUT WHO? Even more mysteriously, which characters will segue into another round of themed updates later this month? No one really cares, but stay tuned anyway! Friends, it’s that time of year when we give thanks to someone who has brought so much joy into our lives and made us the people we are today. This man has given so much, but always asked for much more in return. So let’s celebrate gaming’s favorite fire-breathing, Tyrannosaurus Rex-beating strongman and master of cameos, Karnov! 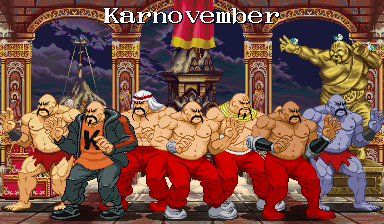 Be sure to check out the Karnovember on Tumblr to see more Karnov appreciation! I’ve improved the “Karnov: Bad Dudes stance” I made last year and added outfits from Fighter’s History and his cameo in Street Hoops. These sprites have been added to the Data East gallery and GFX Generators. A Karnov’s Revenge-style Karnov logo and the Fighter’s History mini-logos have been added to the Data East mini-logo page. edit: I don’t know why I kept referring to Street Hoop as Street Hoops, but I’ll clear that up in the other parts of the site once I get the chance.